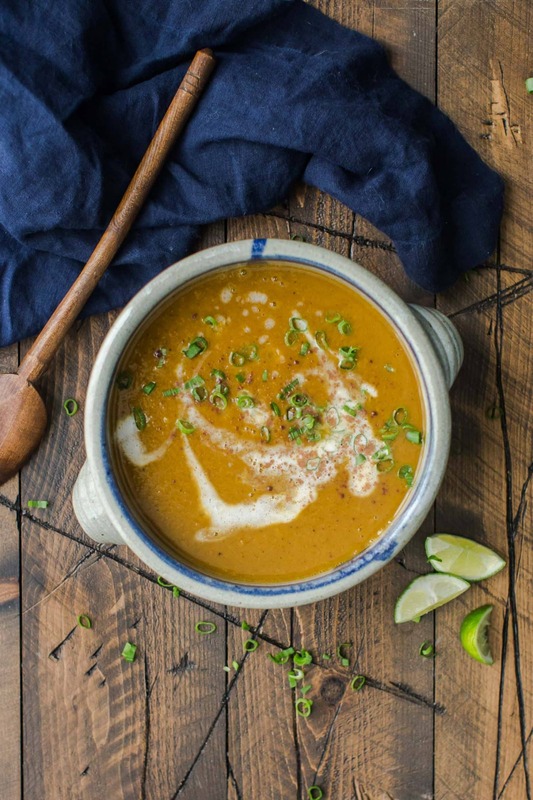 Roasted Five-Spice Pumpkin Soup | Naturally. Post in partnership with Frontier Co-op. See below for more details. One of my favorite items to use during the fall season is pumpkin. I’m not talking about the creamy puree you buy in a can but rather the actual pumpkin. In fact, it’s easy to roast as you would any other winter squash. 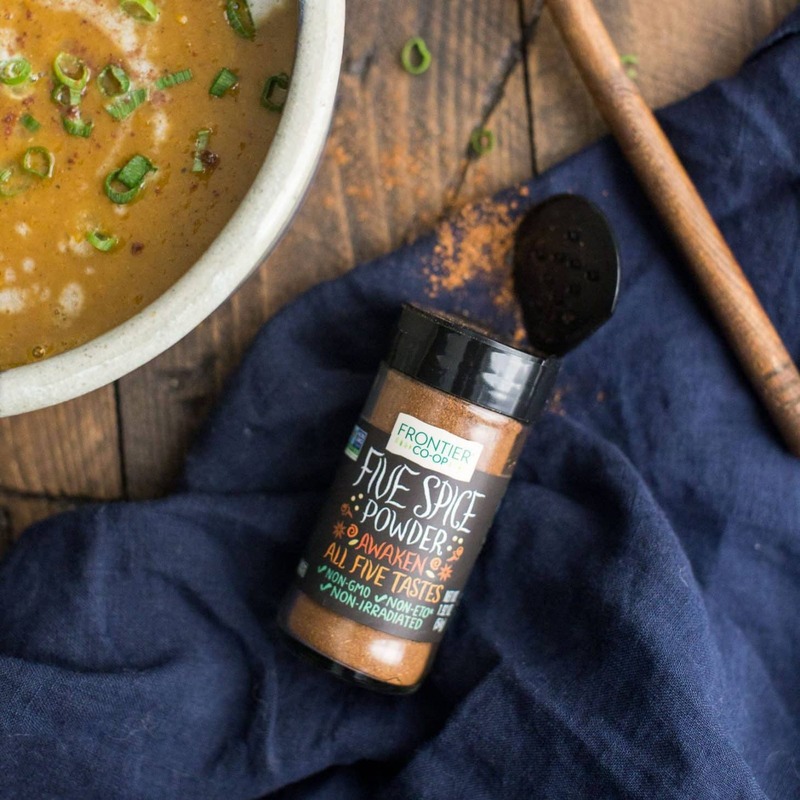 In this roasted pumpkin soup, pumpkin is combined with aromatic five-spice powder from Frontier Co-op, parsnips, and ginger. 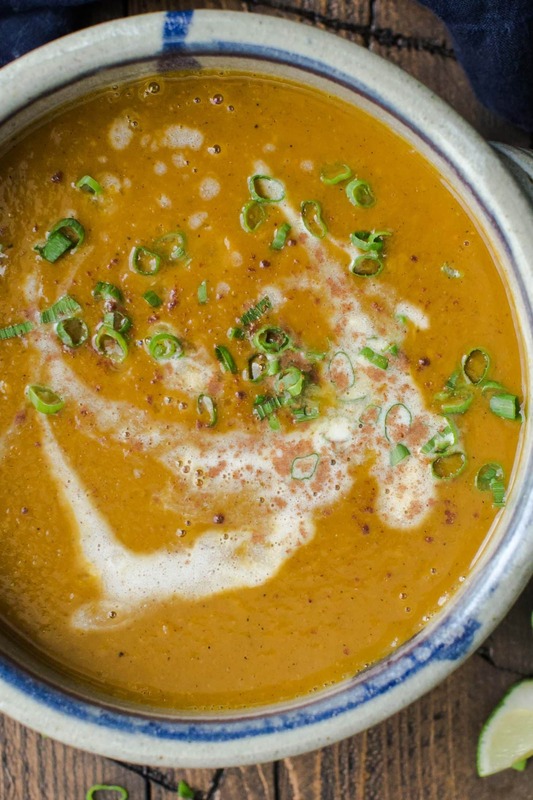 The result is a creamy and flavorful soup that is perfect for those cooler fall nights. Look for smaller sugar pie pumpkins next to the butternut and acorn squash at farmers’ markets or at your local co-op (it’s national co-op month after all)! A favorite twist on pumpkin soup that uses five-spice powder to create a warm and rich flavor. Make an extra batch or two and freeze to eat throughout the month. Cut pumpkin into wedges and remove seeds. Then place on a parchment lined baking sheet. Sprinkle with 1 teaspoon of five spice and toss with 1 tablespoon of coconut oil. Trim ends of parsnip and chop into large sections. Transfer to second baking sheet. Then cut shallots into quarters and transfer to baking sheet with parsnips. Add sliced ginger root. Sprinkle with 1 teaspoon of five spice and toss with 1 tablespoon coconut oil until well coated. Roast parsnips, shallots and ginger on top rack of oven for 20 to 30 minutes, until parsnips are tender. Roast pumpkin on lower rack of oven at the same time for 35 to 45 minutes, until fork-tender. Remove vegetables from oven and let cool. When cool enough to touch, peel pumpkin skin off roasted pumpkin and discard. Transfer roasted vegetables to a blender. Add vegetable broth, water, lime juice, and 1 teaspoon of five spice. Puree until smooth. Transfer soup to a pot. Finally, bring to a boil on medium heat and reduce to simmer for 15 to 20 minutes. Serve with chopped scallions and a swirl of coconut cream. Tips & Tricks: Add about 1 tablespoon of fresh minced ginger when you puree the soup if you want a bit of a kick. For a very smooth soup, pour through a sieve before heating on the stove. I love recipes that only have a few ingredients. It’s easier to swap out an ingredient without changing the flavors too much from the original recipe. 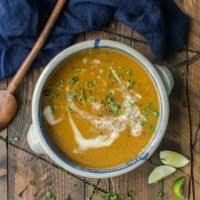 With this roasted pumpkin soup, both the pumpkin and the parsnip can be swapped depending on what you have on hand or what you can find. 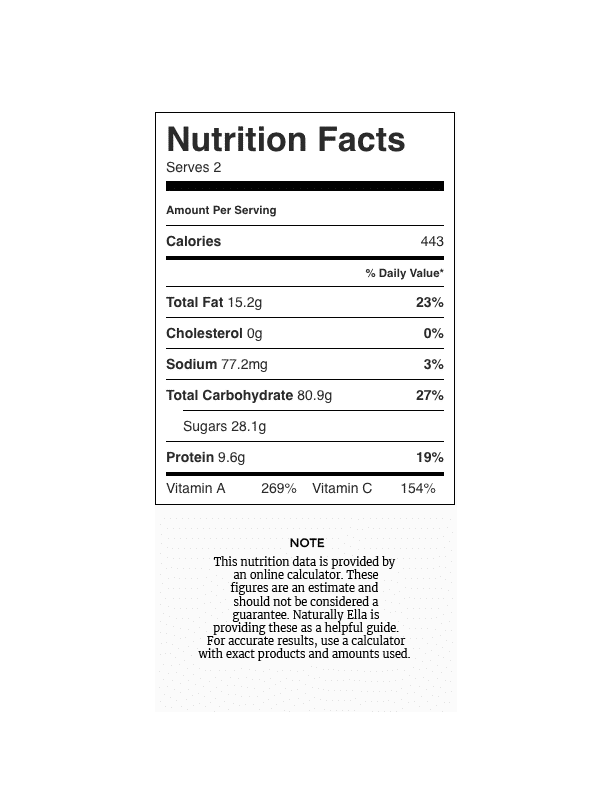 Sweet Potato: Don’t have pumpkin? This soup would be excellent made with sweet potato instead. Dice all vegetables to a 1 inch dice and roast for 30 to 40 minutes, until fork-tender. Then blend with other ingredients. Root Vegetables: You could swap parsnips out and use carrots or celeriac instead. Greens: Add chopped greens such as swiss chard or kale to the soup after you puree. Disclosure: This recipe was created in partnership with Frontier Co-op. All thoughts and opinions are my own. It’s content like this that helps me keep this site running to provide the vegetarian recipes you see every week. One of my preferred products to use during the fall season is pumpkin. I’m not talking about the luscious puree you buy in a can but rather the actual pumpkin. In fact, it’s simple to roast as you would certainly other winter months squash. I’m in total love with this idea, and your pictures are regularly fantastic. Many thanks for sharing this tasty recipe. Could you use butternut squash? Wish there were comments of people that actually made this recipe. Most people are commenting/sharing on social now-a-days so it’s hard. You can use butternut squash. Sweet potatoes would also be nice.